Nacho Doce/Reuters Plans to hold the opening ceremony at Morumbi stadium in São Paulo were scrapped because of problems with the stadium. Less than a month after the conclusion of a successful World Cup tournament in South Africa, the Brazilian sports minister touted the promise of the 2014 tournament in Brazil and responded to familiar concerns over the readiness of stadiums. "I believe the world will be surprised by the country it will be discovering in 2014," Orlando Silva Jr., the country's minister of sports, said in a conference call Wednesday. "Infrastructure investments are important not only for the event, but for our people. We are particularly interested in improving our public transportation infrastructure." Brazil, like South Africa, will use the quadrennial soccer championship to remake the physical infrastructure of the country, investing almost $19 billion in projects in the 12 host cities. Silva said $6.5 billion would be spent to upgrade public transportation, with $3.1 billion to be spent on airports. The federal government will pay for 70 percent of the total investment, with provincial and municipal governments covering another 8 percent. "The World Cup is a national project," he said. "This makes preparing for the World Cup somewhat complex." One of the most complex challenges will be finding a suitable stadium in São Paulo, the country's largest city and the birthplace of Brazilian soccer. Stadium construction was also a persistent concern in the lead-up to the 2010 World Cup in South Africa. "These are the opinions of those who ignore the reality of the country," Silva said through a translator during the conference call with reporters. He added: "FIFA will have to do its part because projects for the stadiums were approved only this May, and you could not start work on the stadiums without the projects having been approved." 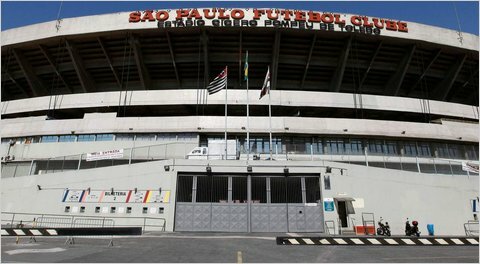 The 50-year-old Morumbi stadium in São Paulo is insufficient, according to FIFA, and plans to renovate the facility were scuttled when organizers missed a May deadline to secure $135 million in financing. Plans to hold the opening ceremony and inaugural match at Morumbi were scrapped. Without an upgrade or construction of a new stadium, the city could be left out of the World Cup altogether. "I got a report on the status quo of the Brazilian stadiums; I have to say it is not very nice," Jérôme Valcke, FIFA's general secretary, said in May. "It is amazing how Brazil is already late. The stadiums are the basic points we need to have a World Cup, and in Brazil, for the time being, most of the deadlines are already over and we have to work on new deadlines." Brazil last hosted the World Cup in 1950, and the 2014 tournament will be the first in South America since 1978, when Argentina hosted and won the championship. But Silva is confident that with four years to go there is plenty of time to address FIFA's concerns and realize organizers' ambitions. "I believe in the last months FIFA was focusing on the World Cup in South Africa, and we are waiting for a stronger, more active physical presence of FIFA in Brazil so we can, hand-in-hand, prepare for the World Cup," Silva said. "It's a challenge that we will meet, and FIFA will be a fundamental partner in that regard. They will do whatever they can for us to have a positive event, I'm sure of that." He added: "São Paulo is the only bottleneck in preparing for the 2014 World Cup because the other 11 cities are preparing at a very good pace." The investment plan for the 2014 World Cup includes $2.7 billion for stadiums, but it is not to exceed $226 million or 75 percent of the total cost of any one site. Construction on stadiums in Manaus, Cuiabá, Natal, Salvador, Belo Horizonte and Brasília is moving along. "We are preparing for the World Cup at the same time we're preparing to host the Olympic and Paralympic games," Silva said. "We are trying to maximize investment in sensitive areas covering the two events." Rio de Janiero, which will host World Cup matches, will also host the Summer Games in 2016, and three other World Cup cities will serve as Olympic soccer sites. "Areas such as airport infrastructure take into account the projected demands of both 2014 and 2016," Silva said. "And of course we've discussed with FIFA and the I.O.C. so that the media center that will be hosting the World Cup can also be used for the 2016 Olympics as part of the media and broadcasting centers."